Belle villa située dans un cadre paradisiaque en bord de mer, très bien entretenue. La plage est très peu fréquentée, il est très agréable de s'y baigner et de s'y promener. On peut même accéder par la plage à un petit warung qui propose des plats de poisson. La maison est entretenue chaque jour par deux jeunes femmes adorables et surveillée la nuit par un gardien très serviable. La cuisine est équipée simplement mais il ne faut pas hésiter à demander à Illuh d'y préparer de succulents petits plats balinais. The location of this villa is magnificent as it faces the sea. However, there is a busy road on the back of the villa and the traffic can be quite noisy. The villa was to have maid, pool boy, gardener and a watch man. All those jobs, night watchman were done by the maid. The villa is old and has not been maintained well. There are stains on the couch, pillows are brown with sweat stains, towels are falling apart, some have stains, others have holes. Kitchen, very old and looking super tired, is equipped with mismatched plates and very old pots and pans. We felt that the price of almost $200 a day was excessive for this villa and decided to move to another accommodation. The host was very obliging and agreed to 100% refund of the unused portion of our booking. We both ended up with ear infections which which started during our stay in this villa and required a doctor visit and treatment. We firmly believe that this was due to the pool in the villa not maintained properly. Even though the maid collected leaves that have dropped into the pool she had no idea how to test the water to maintain it properly. This was not a great experience, however, the host responded to our decision to move very positively and we were grateful for that. It appears that the owners decided not to spend any money on maintaining it. It was an amazing stay, the villa was in line with the pictures. Despite being at 3 hours from the airport, it really worth it if you are looking for a place far from the crowd. We were traveling with two kids (10 and 11 years old) and honestly, the road from Denpasar to Air Sanih was a breeze, kids enjoyed the landscape, we even had a stop at the mountain to feed the monkeys. Iluh was very helpful and cooked us diner every day. She’s observed our preferences and adapt herself to our habits (morning coffee, diner time etc…). Each dinner was different and it was a pleasure to try all those nice dishes she’s prepared. Close by the house (300m) there is a great restaurant as well where you can try fresh seafood and enjoy a great view. We’ve spent 3 days in visiting various places in the island, and Made, the driver was great in proposing a list of things to see and to do. We just had to pick the options and decide the days and time. Prices were very reasonable. All in all, it was a wonderful experience, the location is just wow. We clearly recommend the villa and will surely go back again. We had a great time in Bali! The villa was very nice and the staff was "ok"with the exception of Made. Iluh, a great cook and housekeeper but very pushy with tipping. Our group had not researched the proper way to tip, and had planned on tipping at the end of the week which was a bad idea and Iluh made sure we knew the issue. Our group felt "pushed" to use her services. The gardener was very nice and will go over and beyond his duties, which was nice. We happened to be in Bali for a very large Hindu ceremony, which he had offered us traditional sarongs and accompanied us to the ceremony. For the "house manager", he was awful! He did not explain any of our issues anad spent all of 10 min with us on the second night, and would not fix our a/c issues. He also had a very poor attitude and could not get away from us sooner. As for the driver, Made he made our trip to Bali!! He was the best part of Bali. Made not only booked everything we wanted but treated us like a real friend! I had gotten very ill from something and he went out of his way to give me remedies and make sure I was nursed back to good health. I cannot praise him enough, deff request the private driver for the time you are in Bali. His prices are fair and he is able to get any excursion you want at a discounted price. His english is exceptional as well! The owners are quick to your emails and felt they answered questions very well. I would all- in -all use this villa again and recommend this to anyone who likes quiet and relaxing places! If you are looking for the party- touristy places south Bali is your place. The north will give you friendly locals (with little english but eager to learn), great culture, and beautiful scenery. The north is beautiful and very quiet, great for a quiet group. всё отлично .. немного надоедал персонал вилы - не прогонишь !!! приходилось говорить -уходите домой вы ненужны !! вила очень ухоженная , чистая , красивая . да , вернемся еще ... расположение великолепное для тихого отдыха . пляж чистый . единственный минус - отсутствие гриль зоны !!! We had a great time! The Villa and especially the staff, Iluh and Nengah are wonderful and friendly people, that made our stay very special. Thank you Julien for organizing everything for us! Our driver Made did a fantastic job and is super reliable!!! The location was perfect for us, as we were seeking a quiet retreat and we found our oasis here. 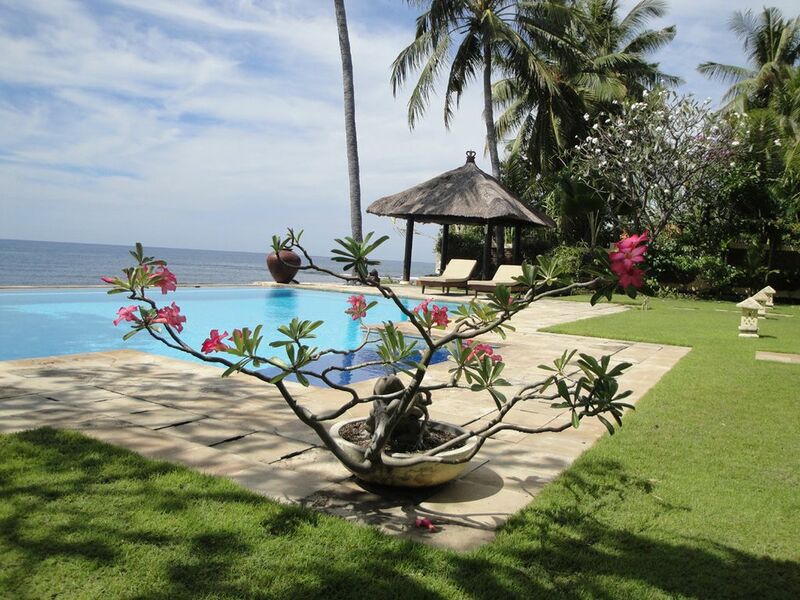 A perfect garden and pool right on the beach, great swimming in the sea and fanstastic cooking by Iluh. If you are into bars, different kind of restaurants and action, this might not be for you.